Mardi Gras is a big deal in New Orleans and there are some big numbers associated with it — 1.4 million, the typical number of visitors the city gets during the Mardi Gras season. Or $250,000, the cost of the most elaborate of Mardi Gras parade floats. There’s another big Mardi Gras statistic that was revealed recently — 93,000. That’s the amount of pounds of Mardi Gras beads cleaning crews have pulled out of clogged storm drains in New Orleans since September. “Once you hear a number like that, there’s no going back. So we’ve got to do better,” Dani Galloway, interim director of the New Orleans Department of Public Works, said at a news conference in late January. According to a report in the Times-Picayune, contractor Compliance EnviroSystems cleaned 15,000 catch basins in the city from Sept. 26 to Jan. 23 under a $7 million emergency contract and collected about 7.2 million pounds of debris. The 93,000 pounds of Mardi Gras beads included in that amount came from a five-block stretch on St. Charles Avenue, a main parade route. The catch basin cleaning was a response to widespread flooding last summer that many New Orleans residents blamed at least partially on a backlog of clogged catch basins. And the cleaning is ongoing. The city has a total of 68,000 catch basins. Public Works’ goal is to clean another 6,000 of them this year. In the meantime, there’s the issue of the 93,000 pounds of Mardi Gras beads just recently removed from the storm sewer system. So for the conclusion of this year’s Mardi Gras season last week, New Orleans Public Works developed a quick method to help with the problem. “It was as simple as a visit to Home Depot to try to figure out what we could do that would be, obviously, low cost and a fairly quick turnaround,” Galloway says. 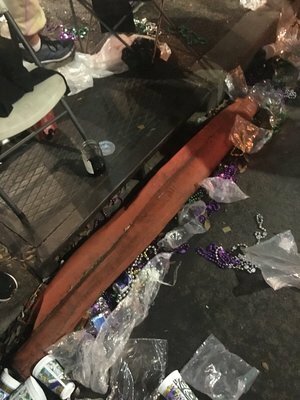 Using metal grates and large orange sandbags, Public Works constructed hundreds of devices that could capture debris like Mardi Gras beads and installed them in storm drains all along the parade route.